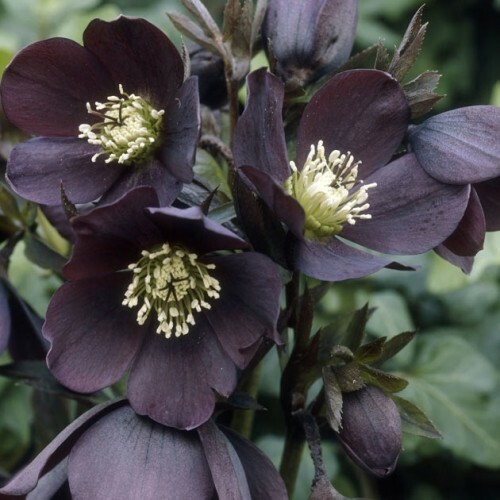 'Black Magic' has evergreen dark leaves and blooms in the winter season with dark purple, almost black flowers. Commonly known as Lenten Rose, Helleborus orientalis 'Black Magic' is a clump-forming, late winter-blooming perennial that features large, cup-shaped, rose-like flowers with centre crowns of contrasting white stamens. The flowers usually appear in clusters of 1-4 on thick stems rising above the dark green foliage. Plants will remain evergreen in moderate winters, but may become scorched and tattered in extremely cold weather, particularly if not insulated by snow cover. Blooms in late winter (sometimes when snow is still present) and continues into spring, with a long, 8-10 week bloom period. Please note that leaves, stems and roots are poisonous.